I do most of my hauls at stores such as RiteAid, CVS, Walmart, Walgreens. I loved it when I purchased over $200.00 worth of items from Walmart and all the items were not only free but I was paid to take them from the store. Extreme Couponer Jane Franco who has appeared as an expert on extreme couponing for The Local NBC Affiliate WPXI in Pittsburgh, Pa. does not just shop for items, with her coupons she shops for freebies and deals. And that message has caused her following to her blog and YouTube videos to grow tremendously. “I love it, stated Jane. Folks love to see my money saving hauls. My goal is to find items on sale or clearance with my coupons that I can get free or near free. I am all about saving money, and I try very hard not to spend much of it at all. And I have become good at what I do, even authoring a book titled 'It Is Easy to Get Free Groceries If You Know Jane.'" 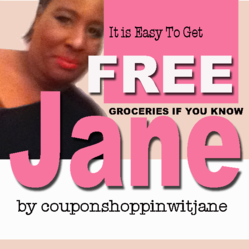 Jane of couponshoppinwitjane, as she is known by her followers, has become extremely popular doing just that: her blog and YouTube following continues to grow. She has built a following of loyal shoppers who love emulating her by going out shopping and doing the exact same hauls of freebies and money savers using coupons. “I upload my hauls daily on YouTube, often times I spend less than $10.00 and get items that retail for upwards of $300.00 or more. My viewers and readers just adore seeing my deals, and most endeavor to do the same deals I show." Today there is a growing trend to use coupons not just on items that are on sale, but also on items that have been marked down for deep discounts and even clearance. Couponing today is nothing like it was ten years ago. More and more couponers are becoming not just extreme couponers but, “bottom-line couponers." In that it is not enough to get cents off individual products, but the bottom line couponer’s high is bringing the items home for free or, in some cases, being paid to bring the items home. Besides, today with many using Social Media to share their latest deals and to get tips on how to save money and where to shop for the best deals, the trend on getting freebies using coupons has become very hot. Most “bottom-line couponers” as opposed to extreme couponers, want to use their coupons on items that are either on clearance or on sale. And Jane is leading the way to show many how to do just that. Giving tips on where the deals are everyday via her Blog and YouTube channel. Her followers continue to explode. Hauls such as this are why Jane gets new subscribers to her YouTube Channel every-day. On her blog, she not only shows photos of her haul, but she also gives Heads Up tips on hot deals on the latest printable coupons out.